Charles Riley Tyre was born Thursday, Aug. 17, at 12:53 p.m., weighing 7 pounds, 12 ounces. One of the first babies born at UF Health North, he came into the world surrounded by his parents and both grandmothers, as his older brother, Lucas, waited excitedly to hold him. Charlie’s parents, Keith and Erin Tyre, had heard about the Labor and Delivery unit opening at UF Health North and hoped it would be ready in time for their own new arrival. The family lives in Yulee, and first selected UF Health Women’s Specialists – North for its proximity. The drive to prenatal care appointments took less than 15 minutes. The Tyres also had a specific birth plan in mind. Their first son, Lucas, was born via cesarean section. For Charlie’s delivery, they hoped for a vaginal birth after cesarean, or VBAC, which is not offered at all hospitals. UF Health North provides VBAC options so mothers who qualify and want to experience natural birth after C-section can have that opportunity. “We wanted to have a natural birth the first time around, but Lucas was malpositioned. He stopped progressing at a certain point, and I had a C-section. Given that everything was good with this pregnancy, and there were no complications, we were able to do that,” Erin said. Erin was able to tour the delivery suites on opening day, Aug. 15. “I was originally due Aug. 28, so I was just hoping everything would be ready before we went,” she said. “We wanted to deliver here all along — it’s brand-spanking new.” UF Health North was fully prepared when Charlie made his early debut. “My water broke around 4:30 a.m. After that my contractions started to progress. I think we got here around 7 a.m. My labor lasted around eight hours, and I pushed for two hours. It was good — as good as a natural labor can be,” Erin laughed. Sherrie-Lee Brown, MD, and Angela O’Donnell, DNP, a certified nurse-midwife, were on call and helped deliver Charlie safely. Erin will return soon for her postpartum checkup with UF Health Women’s Specialists – North, and Charlie may also begin his pediatric care on campus as well. As for her birth experience at UF Health North, Erin is grateful for the support of providers and staff. For more information about the Labor and Delivery unit, visit North.UFHealthJax.org/babies. 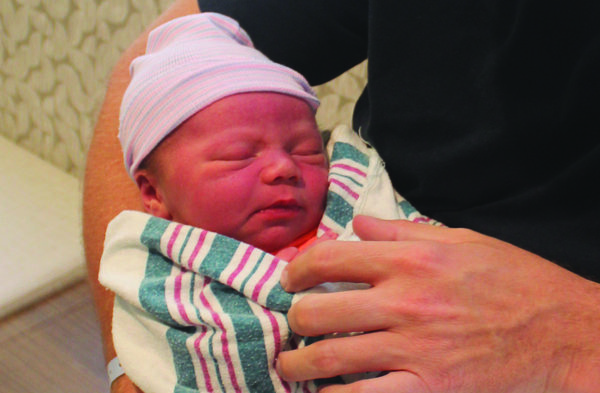 Cameron Theophilus Mayhew was the first baby born in the UF Health North Labor and Delivery unit. He was born Wednesday, Aug.16 weighing 6 pounds,15 ounces and measuring 19 1/2 inches long. Both mom and baby are doing well. Congratulations to the family on their new addition and to our team of providers on the first of many successful deliveries! Charles Riley Tyre, one of the babies born during UF Health North's first week of deliveries. 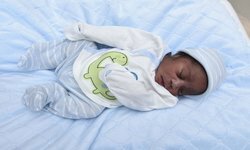 Cameron Theophilus Mayhew, the first baby to be born at UF Health North after opening the Labor and Delivery unit.